It can be hard to keep track of the terms a dentist throws around while you’re sitting in their chair. Words like crown and bridge are more familiar phrases, but what is an abutment? Traditionally, an abutment is a weight-bearing component of a structure such as an arch or traffic bridge. A dental abutment performs this same function in the mouth by providing support to a dental prosthesis, such as a bridge, removable partial denture or implant. A dental abutment or custom abutment is the part of a dental restoration that secures whatever prosthetic is being placed. Dental implant surgery is the process of replacing missing teeth with metal posts that are placed in the jawbone. Dental implants and the accompanying restorations can increase the life of surrounding teeth and may even preserve the jawbone when compared to traditional bridges and removable dentures. 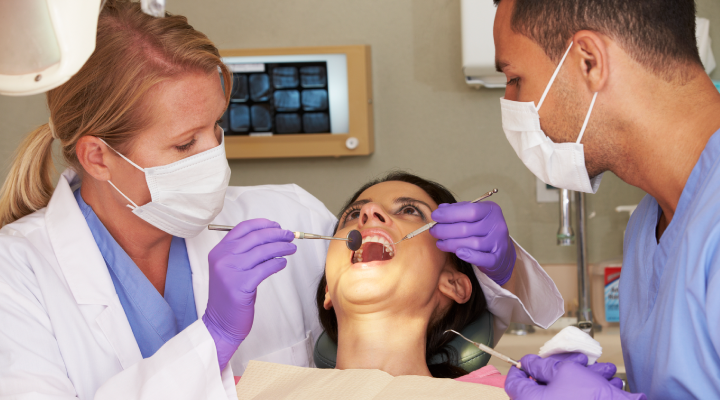 These new dental restorations need a way of staying in your mouth. That’s where dental abutments come in. First, the implants are surgically placed into your jawbone and are left to heal and integrate. Once the implants are fully ready, abutments are placed in the implants, allowing implant crowns, fixed bridges or dentures to be connected to your jaw. This will allow them to fit naturally and fill any gaps in your smile. After that, they are used just like your regular teeth. Abutments are not limited to implants. Sometimes natural teeth are used as abutments, as in the case of a traditional fixed bridge. This process is less invasive and the natural teeth are prepared to support the bridge, which is then cemented into place. Find a dentist in your area. | Login to your account to check your coverage.